Fallout: Wasteland Warfare is a game of miniatures and exploration and most of all combat in the Wasteland. Designed by Modiphius, Wasteland Warfare puts players in charge of a crew that comprises one or more of the various factions in the Fallout universe. Players will assemble their crews and head out into the Wasteland to go head to head with each other, or join forces, and command their crews against an onslaught of Wasteland encounters run by a fiendish AI deck. So whether you’re looking to team up or take out your friends, Wasteland Warfare is a pretty cool way to do exactly that. We’ve been excited for this one for a while. 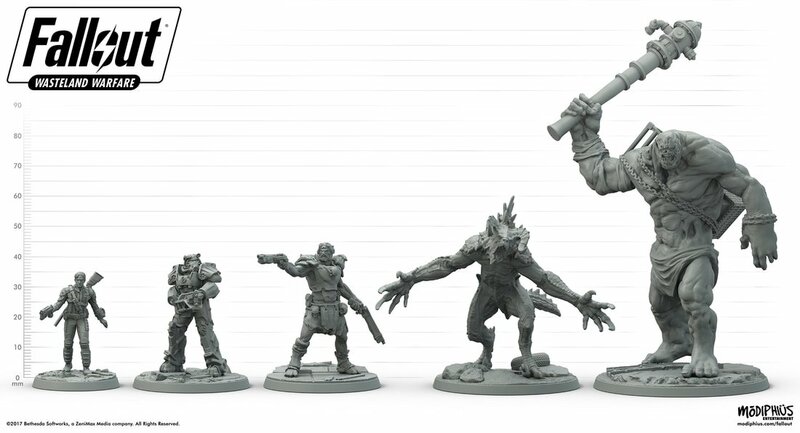 When the game was teased at Gen Con more than a year ago, we were impressed by the quality of the miniatures. And since then we’ve seen more and more factions present in the world, and the more we see, the more it really feels like you’re strapping in to wander through a Wasteland straight out of any of the Fallout games. You’ll find retro-50’s sci-fi refuse packed along with mutants, super-mutants, death claws, even aliens make their appearance in the Two-Player starter set. It’s all there. Down to the S.P.E.C.I.A.L. attributes of your characters, there’s even a V.A.T.s system for characters. But this all comes with some complexity. The game is definitely one of those ones that takes a while to get used to it. And if you’re just starting out, the maps included in the box are probably going to be alright for now, but you’ll want to get some terrain and other things to actually take advantage of your wasteland. 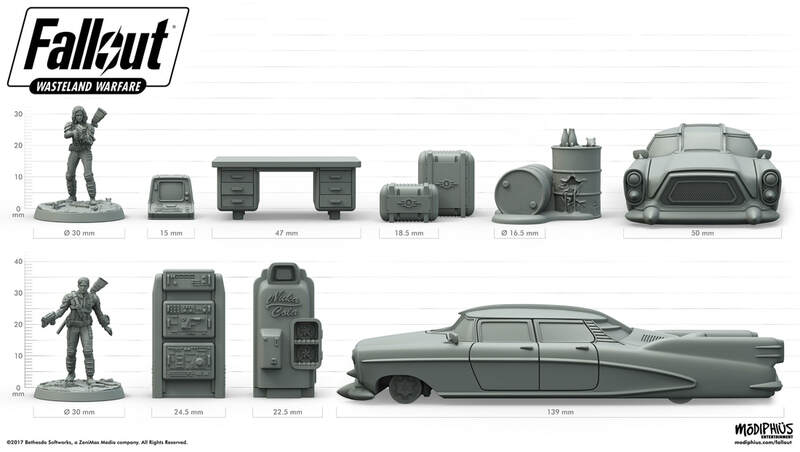 We know Modiphius has been designing some larger terrain features–these include the atomic roadsters and abandoned fueling stations that almost invariably hide raiders and Deathclaws. In the Two-Player starter set, you’ll get everything you need to get the game going. You’ll have enough to put together two different crews which you can then battle your friends with, or you’ll have enough for two smaller gangs that you can take into a hostile Wasteland that’s teeming with radscorpions and hidden explosives. 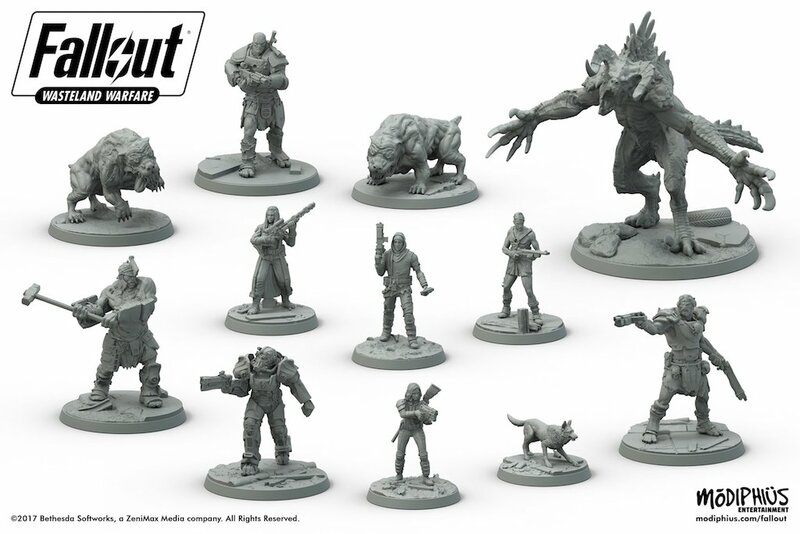 Here’s every mini you can find in the 2-player Starter box, from Dogmeat to Deathclaw. Seriously, the game elements are all there, including the random supplies that you can salvage to try and earn back extra caps. When we were looking through the box, we found superglue cards, and random staplers, etc. If you are a Fallout Fan and looking for a little more combat, then this is well worth checking out.